Described as “explosive” by the Irish Post and an “important” book by the Guardian ‘The Death of Justice’ continues to get five-star reviews on Amazon. This is the inside story of a brutal murder as revealed by Michael O’Brien, one of the men wrongly jailed for more than a decade. The miscarriage of justice which followed sent shock waves through the British legal system. The book contains a detailed analysis of the murder and police inquiry, a no-holds-barred view of life in jail and an essential guide for anyone trying to prove their innocence. ‘The Death of Justice’ is now available not only in paperback but as an e-book on Amazon. It is published by Y Lolfa. This is a book everyone should read. It tells the story we do not want to really think is possible. How does an innocent person end up in prison? The police behaviour is undefendable. A very readable, unputdownable, book. EVERYONE should read Michael’s book. You’ll be appalled at the things the police did, but don’t believe their story about ‘bad apples’. This behaviour was systemic, and recent events indicate that the CPS to this day is ill equipped to cope with it. It is definitely the most informative book I have EVER read about our British Justice System. Huge eye opener but what a fantastic read, I will never look at the justice system the same ever again. For anyone in doubt about the terrible damage done by a justice system which gets it wrong, this book is a must read. For anyone fighting a wrongful conviction, Michael’s book offers hope, and the encouragement to never, ever give up. For anyone who thinks British Justice is the best in the world, this book will open your eyes. An incredible story, and a remarkable man. I think that the content of the book would be beneficial to anyone who is helping to fight a wrongful conviction, as out of this harrowing story there is hope and encouragement. It would also be an eye opener to law students and those interested in the judicial system in our country. The only way we will learn and gain knowledge of how things can and do go wrong is by listening to and reading the accounts of those who have walked the walk, when the system gets it completely wrong. The man who advises both the Crown and the UK Cabinet on the law has expressed his “huge regret” at the collapse of the Lynette White police corruption trial. The UK Solicitor-General Edward Garnier QC was answering questions from MPs about the collapse of a trial of eight police officers accused of perverting the course of justice during the 1988 hunt for the murderer of Lynette White in Cardiff. The trial collapsed in December and the officers were acquitted after the judge ruled they could no longer get a fair trial as certain documents were thought to have been shredded. Then, last month, IPCC commissioner Sarah Green released a statement to say they had not been destroyed after all and were still in possession of South Wales Police. This week, Media Wales reported that former barrister and Conservative MP Robert Buckland tackled Mr Garnier about the decision to let South Wales Police investigate itself. Mr Buckland called on him to ensure “such reforms take place so that such a disaster does not happen again”. Mr Garnier stressed that an inquiry into the Lynette White case is underway with the Independent Police Complaints Commission carrying out a review of police conduct; he also noted that the Director of Public Prosecutions has “separately asked the inspectorate of the Crown Prosecution Service to carry out a review of the actions and decision making of the CPS in relation to disclosure in that case”. Cynon Valley Labour MP Ann Clwyd said: “There is considerable shock at the conduct of this case, in south Wales and elsewhere. In the past, there have been a particularly high number of miscarriages of justice under the South Wales police force. Mr Garnier said: “Off the top of my head, I am not aware of any such cases, but the right honourable lady is right to point out that the collapse of the Lynette White case in South Wales just recently, which affects her constituents and neighbours… is a matter of huge regret. Blaenau Gwent Labour MP Nick Smith asked what assessment had been made by the CPS about the prospects of a prosecution and reminded the Commons of the scale of the case. The Solicitor-General said the CPS “will not make an assessment until the two inquiries are completed”. A major review has been ordered into the way the prosecution in a police corruption trial was handled. Eight officers were cleared of perverting the course of justice after a judge at Swansea Crown Court ruled they could not get a fair trial. It had been alleged that the former South Wales Police officers had manufactured the case against five men – three of whom were jailed for life before being released on appeal. The retired officers all pleaded not guilty to the charge and were cleared after the Crown Prosecution Service (CPS) offered no evidence against the defendants. It emerged that files relating to complaints by a murder trial defendant had been destroyed – a revelation which called the trial’s disclosure process into question. The trial – relating to the 1988 hunt for the murderer of Lynette White in Cardiff- had already been sitting for five months when it collapsed in December and had cost an estimated £30m. Today, the Director of Public Prosecutions, Keir Starmer QC, ordered a full inquiry into the trial. “Shortly after the collapse of this trial I initiated a full and detailed review of the circumstances in which the decision to offer no further evidence was made,” said Mr Starmer. “I asked leading counsel for the prosecution to prepare a comprehensive analysis of the reasons for the decision. *And whether the existing legal guidance is appropriate for cases of similar size and complexity. HM Chief Inspector, Michael Fuller, said: “It is important that the public can have confidence in the way the CPS conducts its cases and the Inspectorate will examine the issues with the utmost thoroughness. Inevitably this will take time but will be completed as soon as is practicable and a report prepared for the DPP. It was meant to be the case in which South Wales Police drew a line under some of the difficult times from the past. Instead, the force and the Crown Prosecution Service in Wales are waking up to difficult headlines about the collapse of the largest alleged police corruption trial ever seen in the UK. The back story to the Lynette White corruption trial is long and complicated. The legal issues impenetrable to many. The saga stretches back 23 years to the bloody murder of a 20-year-old woman and takes in two trials and an appeal, featuring the men who did not kill Lynette, and a trial of the man who did. The details of this have been explored at length elsewhere. What was at question in the corruption trial was what went wrong in the initial police inquiry which saw five innocent men in the stand and three – the so-called Cardiff Three – wrongfully convicted of murder. I spoke to one of those men, Tony Paris, yesterday. He has spent years putting his life in order. Many of the dark times from the past were dragged up during the trial when he was called to give evidence. But the main thing for him is that the real killer of Lynette White – Jeffrey Gafoor – is behind bars. The police saw to it that Gafoor was finally locked up in 2003. With his conviction, the initial case of the Cardiff Three became what legal watchers have called the first “proven miscarriage of justice” in British history. That meant the force had to investigate what had gone wrong back in 1988 when officers first set out to find the killer. The inquiry led to eight former police officers and two civilians facing trial for perverting the court of justice. Charges of which they have now been found not guilty. However, the way in which the case collapsed leaves plenty of questions for the rest of us. Even during these straitened times, we don’t balance the value of justice against its cost. But tens of millions of pounds have been spent on the inquiries in this case – and now more public funds are being set aside to find out how we got here. The issue at the heart of the collapse was what lawyers call ‘disclosure’. In British legal trials both the prosecution and defence have to tell each other what evidence they have. Crucially, this includes the evidence they will use in court and any which they won’t. In this case, evidence – for whatever reason, and the case stretched back many years, remember – had been destroyed. How and why this happened will now be the subject of a major review. In cases like this it seems there can be endless mistakes and inquiries involving the same organisations. A cat chasing its own tail. A story which started in the most violent of circumstances in a small flat in Butetown, Cardiff, continues to haunt Wales more than two decades on. There will be no action taken against witnesses in one of the most notorious miscarriages of justice from the 1980s. The Crown Prosecution Service has been considering action against a number of civilian witnesses who gave evidence in the hunt to find the killer of Cardiff newsagent Philip Saunders in 1987. Three men, Michael O’Brien, Ellis Sherwood and Darren Hall, were wrongly jailed for the murder and spent more than a decade behind bars. At their successful appeal the credibility of more than one witness was called into question. One had admitted telling “a pack of lies from start to finish”. But the CPS has now decided not to take action in the case. “[I] have now completed my review of the evidence obtained during the investigation that took place following allegations against civilian witnesses who gave evidence at Mr O’Brien’s trial at Cardiff Crown Court in 1988,” says a Crown Advocate in a letter to Mr O’Brien’s legal team. The letter adds: “I have carefully considered all of the available evidence and whether it is sufficient to provide a realistic prospect of convicting any person of either offence. 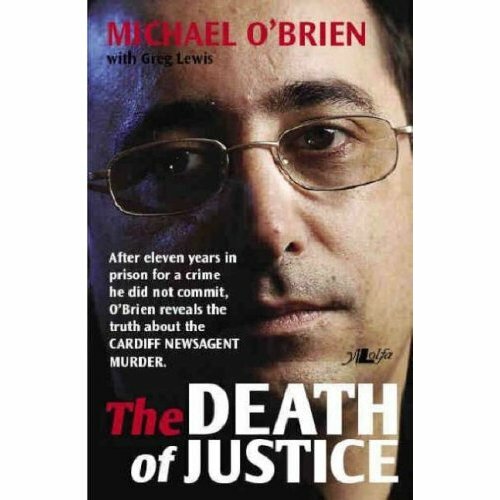 * The story of the Newsagent Three case is told in the book, The Death of Justice. The Home Office and Attorney General’s Office have blocked calls for a public inquiry into the death of a 10-year-old boy who died after a failure to carry out a medical test which would have identified a rare treatable condition. Former First Minister Rhodri Morgan became a late convert to the idea of a public inquiry into Robbie Powell’s death just before he retired from office a year ago. His successor, Carwyn Jones, also felt an inquiry might help the Welsh NHS “learn lessons” about future care. It would also, no doubt, help Robbie’s family – considering they have spent years campaigning for the full facts about Robbie’s death to be made public. However, Mr Jones took advice from Whitehall departments on the matter of a possible joint inquiry. The Welsh Assembly Government said this week: “Confirmation was received during the summer that the Home Office and Attorney General’s Department were not agreeable to the setting up of a joint inquiry. Since then the First Minister has been considering the matter further. Robbie Powell, of Ystradgynlais, died at Morriston Hospital, Swansea, in April 1990 of Addison’s disease after a test that could have diagnosed this rare but treatable condition was not carried out. An inquest in 2004 returned a verdict of death by natural causes aggravated by neglect. His father, William Powell, has campaigned for a public inquiry ever since. Mr Jones said many issues raised by the case fell outside the Welsh Assembly Government’s responsibilities. “The issues that fall within the Assembly Government’s remit mainly touch upon the operation of the health service in Wales,” he said. “An independent investigation by one person simply doesn’t meet the needs and requirements of this tragic case. Nick Bourne, leader of the Welsh Conservatives at the Assembly, has urged Carwyn Jones to reconsider the decision. “The process announced by Carwyn Jones is a long way from what is needed – an open and transparent review into the circumstances surrounding Robbie’s death,” he said. “This is what Robbie’s father has been tirelessly campaigning to achieve and it is what I have been calling for since 2003. “An independent investigation by one person simply doesn’t meet the needs and requirements of this tragic case. Prison snitch evidence is a central feature of many alleged and proven miscarriages of justice. This sort of evidence was important to the conviction of Gordon Park, the so-called ‘Lady in the Lake’ killer, who was found dead in his prison cell on Monday. Today, in the Daily Mail, Bob Woffinden explains why Mr Park’s family will continue to fight to prove his innocence in spite of his death.